For most of us, the dawn of a new year results in some form of self-reflection. Whether you make more resolutions than there are Kardashians or you reject resolution making outright, chances are you’ve given some thought to how you’d like the year ahead to play out. One of the more common goals (and certainly one that tops our list) is to simplify – clear the clutter from our day-to-day lives and find pleasure in the little things. But, where to start? While we can’t do the heavy lifting for you, we can offer a few tips for decluttering one area of your life: your living space. Decluttering doesn’t necessarily mean putting things to the curb; it may just be a matter of putting things away. We’re all guilty of walking by the closet and throwing our coat on the chair or tossing our dirty laundry on top of the hamper instead of in it. Putting things in their place is a great way to start the decluttering process. And once you’ve picked up, you can take things a step further. Reserve the surfaces in your home, particularly kitchen and bathroom countertops, for things you use every day. If, for example, your coffee maker gets a daily workout, leave it out; if you only use it occasionally, store it in a cupboard. 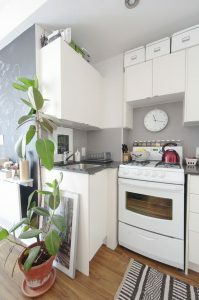 This approach will leave your countertops functional and clutter free. When it comes to choosing storage solutions for your home, look for closed options that blend seamlessly with your decor. 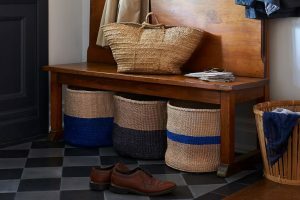 Complementary baskets, bins and decorative boxes are great for staying organized, and they tuck in neatly, keeping everything tidy, streamlined and clutter free. Have I used it in the past year? Will I use it in the coming year? If I was shopping right now, would I buy it again? If it’s broken, is it worth fixing? Would I keep it if I moved? If you answer ‘no’ to one or more of these questions, it’s probably time to sell/donate/toss it. Decluttering your living space doesn’t have to be a chore. Put on your favourite playlist, pour a glass of your favourite wine, take us up on our advice, and you’re well on your way!